It is with great pride that Inner Range announces the release of our Infiniti Class 5 platform. 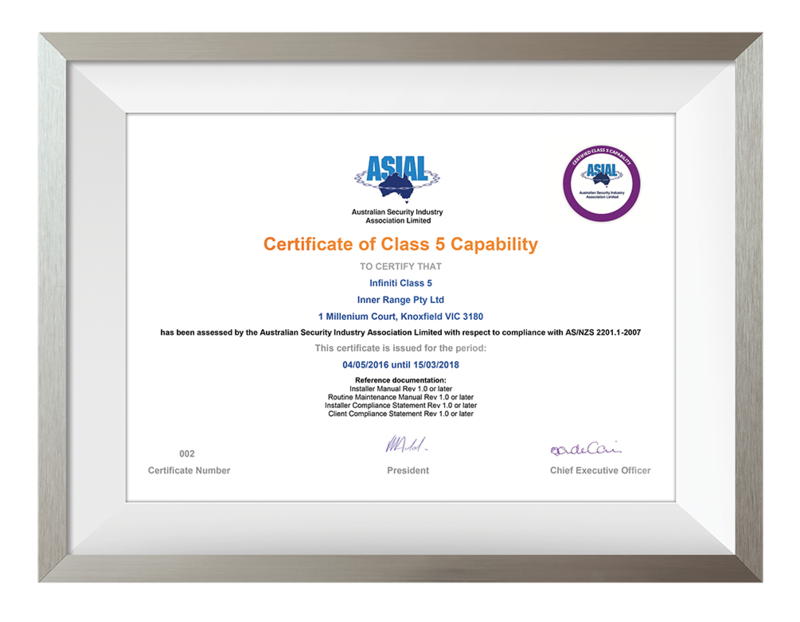 Our Class 5 platform is the first and currently only system with independent certification by the Australian Security Industry Association Limited (ASIAL). ASIAL is the largest security industry association representing the security industry in Australia. A link to view the certificate can be found on the ASIAL website here or seen below (Inner Range holds certificate numbers 1 and 2). Class 5 relates to the AS/NZS 2201.1:2007 standard. AS/NZS 2201.1 is the Australian and New Zealand standard for the design, installation, commissioning and maintenance of intruder alarm systems. Class 5 is the highest risk profile classification defined within this standard and Class 5 sites are typically found in government, military, financial and other high-security environments. To achieve this standard, a derivative model of the Inner Range Infiniti system was enhanced to provide AES 128-bit encryption across the entire system topography from the zone input through to the Controller, and applies to all LAN/WAN communications, alarm reporting paths and card to reader communications. a. The consequences of the attack may be ‘Catastrophic’ regardless of the likelihood of an attack. b. The likelihood of an attack is ‘Likely’ or ‘Very likely’ and the consequences are ‘Major’ or ‘Catastrophic’. The Infiniti Class 5 hardware is certified for use in Class 5 compliant installations when installed, commissioned and maintained in accordance with this standard and the Infiniti Class 5 documentation. For more information see the Infiniti Class 5 product page or contact the Inner Range Infiniti sales team at infiniti@innerrange.com or 03 9780 4300.